Nordic-Baltic Translation Blog : Which are the world's most influential languages? Languages With Historical and Colonial Influence. Which are the world's most influential languages? Languages With Historical and Colonial Influence. What makes a language influential? Is it one with the most speakers? Or perhaps it's the language with the most economic influence? English has certainly been seen as the “international language” for some time now, and many have stressed the importance of learning Mandarin as China’s economy continues to grow. But according to one group of scholars, including cognitive scientist and linguist Steven Pinker, whether or not a language is influential is less about that language itself, and more about how it connects to others. To establish how languages are connected, the scholars looked at three forms of writing. If someone, a journalist for example, wants their story to go global, they will most likely print the story in their native language, as well as in those languages they think will have the biggest reach. First, they looked at over 2.2 million book translations between 1979 and 2011, which were made in over 150 countries and more than a thousand languages. They then looked at which edits to Wikipedia were being done in more than one language, scanning 382 million edits in 238 languages by 2.5 million editors. Finally, they turned to Twitter, looking at 550 million tweets in 73 languages written by 17 million users – more than 10% of Twitter’s active user base. If researching a global language network shows one thing, it's that English remains the number one most connected language in the world. After English, however, there was no single global network, but rather three sets of smaller networks around the world, linked together by languages that have had historical and colonial influence, such as French, Spanish, German, Russian, Portuguese and Chinese. If Chinese is the most spoken language in the world, why doesn’t it find itself closer to English in a global language network? The answer is that while there are more Chinese people online than any other nationality on Earth, they are primarily using websites made by the Chinese for the Chinese, making for a sort of linguistic isolation. Mandarin’s influence is not spreading because, in large part, it's limited to networks such as Sina Weibo (Chinese Twitter) and Baidu Baike (Chinese Wikipedia). A similar phenomenon can be seen in Russia, where VK (Russian Facebook) is used more than many global social networks. Arabic, despite its undeniable importance, did not score as highly as other languages when it comes to the flow of translated information. 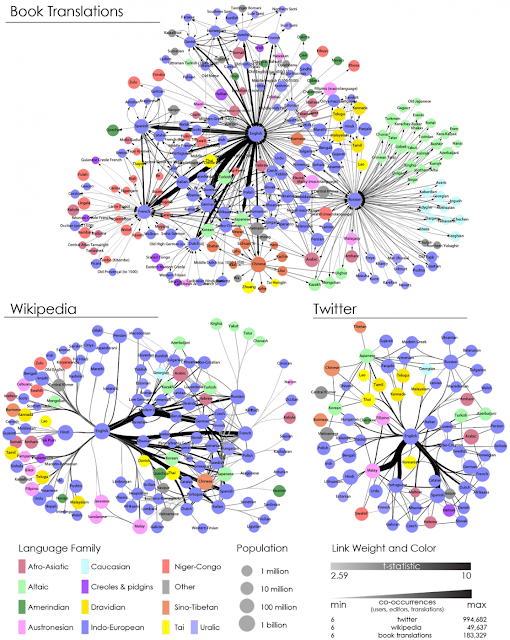 The researchers also found that Twitter has allowed for less widely spoken languages to grow in influence. In the study’s Twitter dataset, languages such as Malay, Filipino and Swahili had larger than expected shares, indicating that “informal” channels were more widely used among speakers.